Scribbles the dog loves to dig and dig! Digs up holes and loves to bury anything and everything he finds! 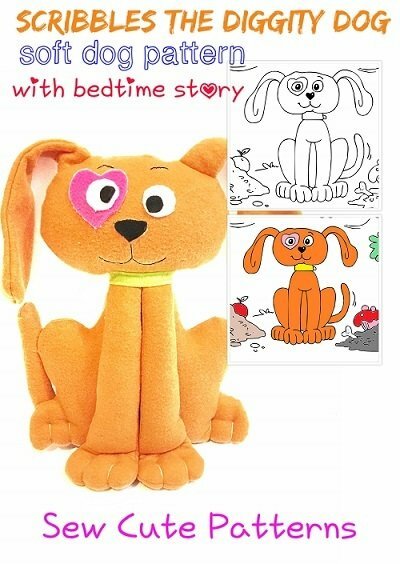 Read the story of Scribbles, the Diggity Dog to your little ones and then make them their own customized Scribbles! Pick out the perfect fabric in their favorite colors to make their new pet come to life! The story is told in a 22 page coloring storybook to make it even more fun and interactive. Your children and grandchildren can color and design the pages of the storybook to make it even more fun and interactive! - 1 PDF sewing pattern with instructions and pattern pieces to make a 14" plush puppy dog. The instructions include photos to help you make your own pet. - Scribbles the Diggity Dog coloring storybook. 22 pages.